Yesterday we visited the brand new children's play centre in Hebburn. It's brilliant. Really well thought through. My toddler loved it (he cried when we were leaving) and (in my mind the most important bit) parent's can have a cup of tea, a sit down and actually get a bit of a rest. There is definitely a time and place for soft play, sometimes they are just what we are looking for - if our toddler needs to work off some energy or if my husband is with us so one of us can go with him, whilst the other looks after the baby. But when you're the owner of a toddler they aren't really a place for a rest, and sometimes I don't want to crawl through a child sized tube, or hurt my feet climbing cargo nets to rescue a strandard little boy (why do cargo nets hurt so much or is that just me being a baby?) So this is where this type of play centre is perfect. As the name suggests it all designed around role play, with lots of different stations where kids can play with toys and dress up pieces. There has been really good attention to detail and the whole place looks great. It is bright and colourful, and as soon as we walked through the door my toddler was off to explore. It is all based in one large airy room, at the centre of the room are tables and chairs, and the stations are built around the outskirts, this is great as it means that you can always see the kids from the table areas, so you don't have to be on top of them all of the time. It would be a really good place to go if you are in charge of more than one child as you can always keep an eye on one of them whilst seeing to another. The baby was spending time with her granny, so wasn't with us this visit, but I noticed they had lots of high chairs, a baby walker and padded play gym for the smallest of visitors to use. It was lovely to have some 1:1 time to properly play with my toddler as we haven't had much of that since the baby came along. It is based in the centre of Hebburn. There isn't a car park attached to the building, but I just parked in the street behind role play, and there were plenty of car parking spaces available. 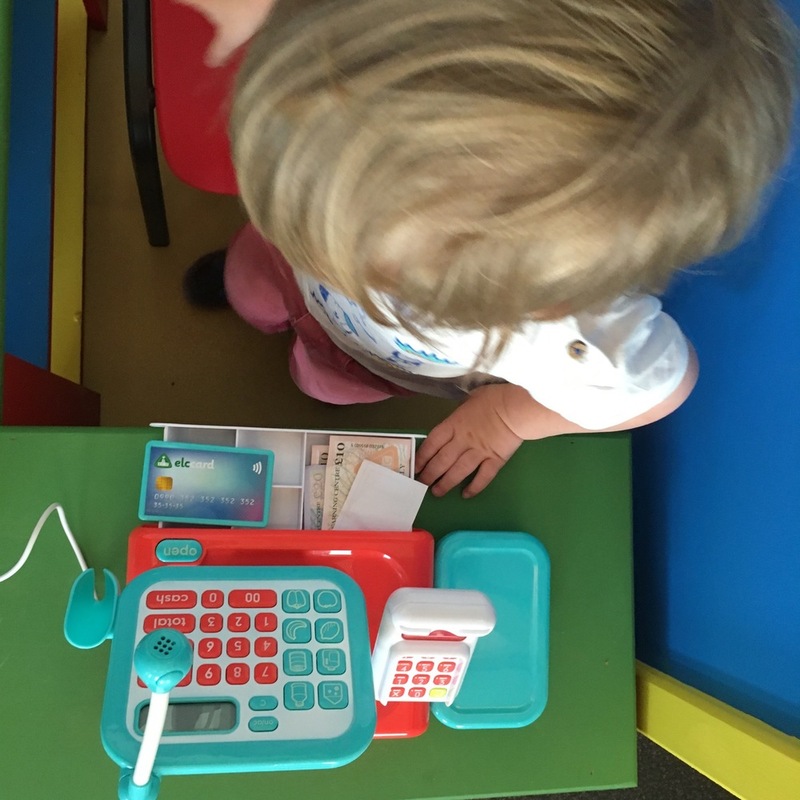 Role play offer 4 sessions a day, each lasting 90 minutes, the cost is £5 per child on a weekend or during school holidays, £4 weekdays during term time. There are 20 places per session. I've been to other facilities like this and been horrified at the thought of squeezing 20 kids in at a time, plus all of their parents, but because of the size and layout of the room, I think that even at maximum capacity it wouldn't feel too busy. At our session there were 7 children in total and it felt really quite quiet. There are at least 8 stations, plus the cars and painted road track, so if it was full there would still be enough to entertain 20 children without them being on top of each other. Saying that I'm sure it would be very noisy - but what isn't when you've got kids? QUICK INTERRUPTION HERE - if you are just going to look at the photos and not read my waffling on (I don't blame you, my motto is always why use one word when twenty will do) then just note if you visit that both adults and children are asked to remove their shoes to keep the floors nice and new looking. Thankfully I had just (well about a month ago) undertaken my yearly toe nail shape and polish so I wasn't as ashamed as I normally would be by my skanky feet, but if i'd realised that I was going to take my shoes off I would have taken a pair of socks with me, so thought i'd get that out early on to save anyone else the humiliation of non cared for feet being unexpectedly on show. The Post Office - Another firm favourite. I couldn't persuade him to wear the Postman Pat outfits, but saw other kids who were clearly more up for the idea of fancy dress wearing their post bags with pride. He did however love posting the little letters through the postbox, and I thought the wrapped up parcels with the addresses of the various stations within role play was a really nice touch. Emergency Services - There were police cars, a fire engine with working flashing light and the dress up clothes. The Shop - Here there were trolleys, to fill with items from the shelves including some plastic fruit and lots of small real life groceries. The Construction Area - It was only once I'd teased fancy dress hating toddler into a high visibility jacket (on for less than 30 seconds and only because I convinced him it was just like Mr Bull's in Peppa Pig) that I realised how desperately his hair needed cutting, he definitely had the builder's mullet look down to a tea. The digger toy is on wheels and so I saw a few kids driving it around the road track. I can see this being a favourite with he parents too, as I watched one of the dad's constructing a complex structure with the bricks only to have to pretend that he was fine with it when his child promptly knocked it down. The Beauty Salon - a whole host of brushes, bows and hair dryers to style the doll's hair. The Baby Area - There were some comfy seats, place for babies to be put down and some toys for them. There were also a few books here to read. My toddler grabbed The Gruffalo's Child and we sat and read through that. The Picnic Area - We spent a lot of time in this last station, which had an artificial lawn, a real tree, and wicker picnic baskets containing gingham table clothes and picnic sets. My toddler loved packing and unpacking the boxes as well as playing with the glasses and plates. After absentmindedly saying cheers and clinking our glasses together went down so well, we spent about 10 minutes cheers-ing and testing out how strong those plastic glasses were as my toddler over enthusiastically banged them together. Vehicles - There is a road track painted on the floor which goes around all of the table and chairs area. There was a big selection of things to drive around it, I saw at least 5 sit in cars, then there was the digger from the construction area, as well as the trolleys from the shop. I loved the road idea, it's really simple but so effective. Staff Interaction - I was really impressed with the staff. When we were visiting there were two staff in the cafe area, as well as one member taking on a front of house role. She greeted everyone as they entered and asked the name of the little ones. During the 90 minute session I heard her address the kids by their names, and even introduce them to the other children, asking if they could play together. I thought it was really impressive and another way to make parent's lives a little bit easier. The kids seemed to get more out of it when they were playing together, and their parents could have a sit down watching them happily playing. The 90 minute session ended with a quick song from the staff announcing that it was story time. All of the kids sat on the picnic area and listened to a story about a boy and his pet hamster, again the staff were really good, asking the kids questions about their pets to keep them interested in the book. The Cafe - We didn't eat whilst we were there, but I did have a coffee, which was pretty reasonably priced at £1.80. The cafe serve breakfasts, lunches and cake (which looked very tempting) as well as confectionary. Toilets - There were two toilets, one with a changing table and some supplies in case you've forgotten or run out of nappies, nappy bags or wipes. I really appreciate it when places have extras of those things. I always pack what I think will be enough when we are going out, but there have been times I've been caught short and it's such a relief if you see that there are nappy supplies you can use without having to leave to go on search of the nearest corner shop. The toilets are accessed down a couple of stairs, so you can't take a buggy down there but they are big enough to take the kids in with you without having to sit them on your knee whilst you have a wee. I took a peek at the party space which is bright and airy, prices are on the website about hiring the play space exclusively and for the cost of party food. The owner told me that there were plans in place to redesign the enclosed outside space so it could also be used which I think would be great. All in all it was a really lovely visit. I think it would be the perfect place to go if you are meeting up with a friend. I find it is impossible to finish a sentence whenever I go to a soft play with anyone, as one of us will always need to go and save a child from some impending danger or realise that you haven't spotted them for 30 seconds and go on search. Whereas here would be great, of course you would still want to play with the kids for some of it, but as you can see the whole room from the seating area and there is nothing that they can really hurt themselves on, you might actually get to catch up with each other. I live quite a way away from it (about half an hours drive) but I know that I'll make the journey again and go back as we had such a good time. Will you be visiting Role Play? Have any suggestions about where I should take my toddler over the summer whilst our favourite playgroups are finished for the holidays? Then please leave us a comment. Disclosure Policy - We received complimentary entry to Role Play in return for an honest review. Unsurprising all of the random blabber and chuntering on in this post is my own. See the about us section of this website for the full corporate speak disclosure policy.